Although Dr. He-Young Kimm first began learning martial arts at the age of 7, he began seriously studying in 1953 under Song Kwang Sub who taught him Yudo (Korean Judo) and Bi Sool. During the 1950’s and 1960’s, Dr. Kimm also began training in a number of styles including Taekwondo, Tang Soo Do, and Kong Soo Do. While studying for his Bachelor of Science Degree in Marine Science, he taught martial arts at the 8th US Army Command Compound, also known as the Hialeah Compound, but discovered that his background in Yudo was insufficient to teach military police and helicopter pilots, so in 1962, he began to learn Hapkido from Won Kwang Wha and Kim Jung Soo at the Shin Moo Kwan school. After graduating from the Maritime College of the National University of Pusan, Dr. Kimm was commissioned as a Marine Lieutenant. In 1963, Dr. Kimm moved to the United States to further his education at Missouri State Technical College, where he also taught Judo and Hapkido. He was the first to teach Hapkido in the US. He graduated in 1969 with a Master’s Degree in History. He also received a Teaching Certificate for Hapkido from Won Kwang Wha in 1969. After receiving his Master’s Degree, Dr. Kimm enrolled in Louisiana State University where he earned his Ph.D. in History. While studying in Louisiana, Dr. Kimm taught Tae Kwon Do, Yudo, and Hapkido classes. When In Hyuk Suh, the founder of Kuk Sool, moved to the United States from Korea in 1974, Dr. Kimm helped him get settled and studied Kuk Sool while helping In Hyuk Suh spread the art throughout the United States. Dr. Kimm also cohosted a number of combination Kuk Sool / Hapkido seminars in an effort to help spread the style. In 1985, Dr. Kimm published a book entitled, Kuk Sool. A year later, in 1986, Dr. Kimm published his Philosophy of Masters book. 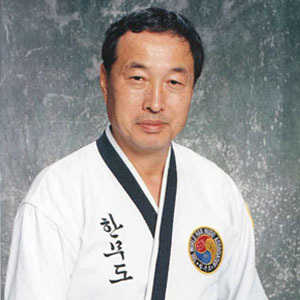 Dr. Kimm then spent several years, from 1987 until 1991, studying Hapkido under Ji Han Jae. With Ji Han Jae’s assistance, in 1991, Dr. Kimm published his book entitled, Hapkido, although it is better known by its nickname, the Hapkido Bible. Dr. Kimm published a second, revised book on Hapkido entitled, Hapkido II, in 1994. Ji Han Jae and In Hyuk Suh both recommended that Dr. Kimm found his own style. After a number of years of work, he created Han Mu Do in 1987. Unlike many styles whose differences are focused on differences in martial techniques, Han Mu Do primarily differentiates itself from similar styles, such as Hapkido, by its philosophy. Dr. Kimm’s Han Mu Do book was later published in 1994. Dr. Kimm’s most recent book, History of Korea and Hapkido, was released in 2008 and details the history of Korea from antiquity up to modern times, as well as covering in great detail the development of Hapkido up to present time. Dr. Kimm is the Founder of Han Mu Do, has a 9th dan in Hapkido, and holds advanced ranks in the numerous Korean martial art styles mentioned above. He is also the President of Dae Han Kido Hwe operations in America and Director of the International Commerce Committee and is the President and founder of the World Han Mu Do Association.